As I haven’t done much to keep in touch with my gardening friends and clients in a while (I’ve been designing and drawing a lot of residential gardens recently), I thought I might start being a little more active with the photos and updates on what’s happening with a few of my landscaping projects, starting with my own garden. So today I thought I’d add a bit of variety to the site and post some random photos of tropical and subtropical autumn-flowering plants that I saw on my lunch-time wander around the garden here with Max and Tess, my dogs. Like most landscape designers I’m passionate about anything to do with plants, tropical and subtropical gardens and would like to spend a lot more time in the garden and less in front of the computer and at the drawing board than I do. My own garden is pretty chaotic. Good structure but hard to keep up with the weeds so the photos don’t always look the best, unlike the clients’ gardens that are so carefully put together from my plans by some great landscapers and owners and lovingly tended. Kevin and I are still building our own house so the garden gets the minimum of attention. 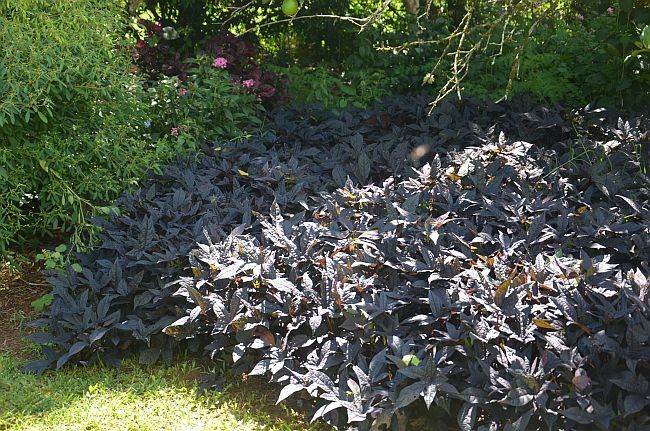 This first plant is the Black Leaved Sweet Potato – Ipomaea batatas ‘Blackie’. It’s much loved by our family as it just smothers the weeds – when it gets too big we mow the edges to a respectable size. Doesn’t seem to be invasive (yet?) just super-vigorous. Great for a lazy gardener like me. It is the most amazing dark purple. So if I’ve designed a garden for you this next plant will probably be in it. A well-behaved spiral ginger – a real landscaper’s plant. Flowers consistently and well-behaved. I recommend this one for any tropical shady garden. I came in vowing to spend more time in the garden but all I’ve really done is think that I should have drawn myself a landscape plan instead of popping in plants that I’ve bought whilst sourcing plants for landscape clients in empty spaces (without enough thought) and do some weeding! Lots of weeding… or maybe I’ll call one of those landscape contractors who do such fantastic work for the clients to help me get it looking a little less wild and I’ll just keep dreaming up new gardens and endlessly drawing. Below is an area of plants where you can see how much work needs to be done. The good old yellow candles (Pachystachys lutea – another favourite) will keep on flowering until the frost starts but it has swamped a beautiful Golden Hibiscus that was the star of the display. Back soon with some better-tended gardens. I must learn to carry my camera around with me. This entry was posted in News on 08/05/2017 by Suzan Quigg.